Wondering what to wear on a rainy day when traveling? Here are some packing tips to help you make the most of the weather – rain or shine! “There’s no such thing as bad weather, only unsuitable clothing” – Alfred Wainwright. Alfred has a good point. 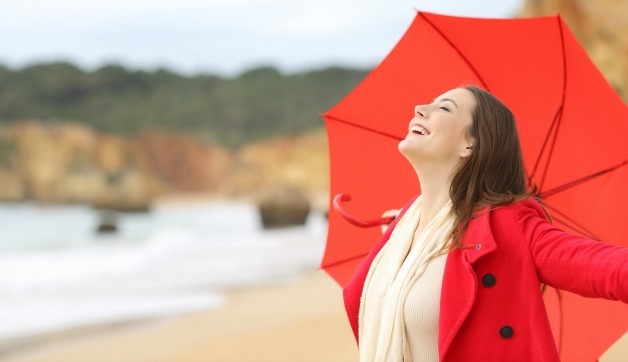 You’re going to encounter iffy weather almost anywhere you go, but as long as you’re prepared and you know what to wear when it rains, you can still have a great time on your trip. Should I pack an umbrella? When we think of a rainy day outfit, we often envision an umbrella. However, if rain is not on the horizon, don’t bring one. 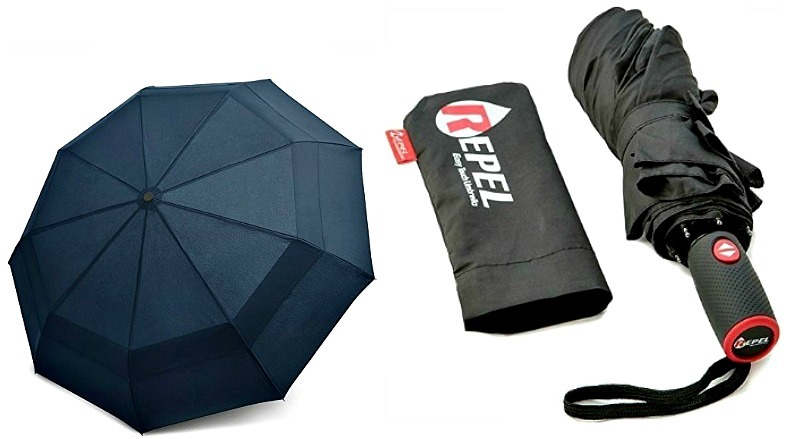 However, if you’re traveling to a temperate climate in the spring, the probability of it raining is higher, so bringing a compact travel umbrella is suggested but not necessary as you can always buy one in your destination if needed. Tip: I’ve never packed an umbrella when traveling to Europe because I know they’ll be cheaply sold at any tourist location by people on the street looking to make a buck. Whether or not to pack rain boots is always one of the biggest dilemmas when planning your rainy day outfit while traveling. Generally speaking, don’t pack rain boots unless you can get multiple uses out of them. For example, if you are staying at a farm, planning to visit the countryside, or hiking in a forest, rain boots can protect against mud or manure. However, if you’re traveling to a city and just want to be prepared for the possibility of rain, leather boots such as the ones shown above are a great all-weather shoe. They’ll go with all your outfits and can be worn in various settings. Packing a functional yet versatile style can help you avoid the need to pack an additional pair of boots just for rain (aka rain boots). Check out more of the best waterproof boots for travel. What type of coat should I bring? 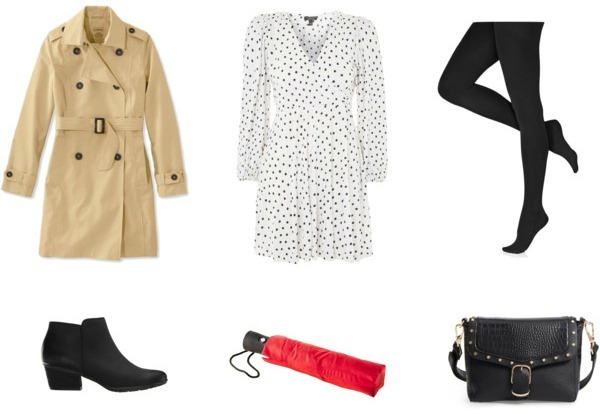 Planning what to wear on rainy days doesn’t mean you need a utilitarian look. You just need to plan the right clothing based on your itinerary. There are a few outerwear options you could wear in the rain: an raincoat, a regular coat with a hood, or a poncho. If you’ll be hiking or have several outdoor activities planned, we suggest a lightweight foldable rain jacket that you can put over other layers. If you’re visiting a city and spending more time sightseeing indoors, aboard a coach, or using taxis to get to and from destinations, opt for a trench coat with a hood or another spring jacket. 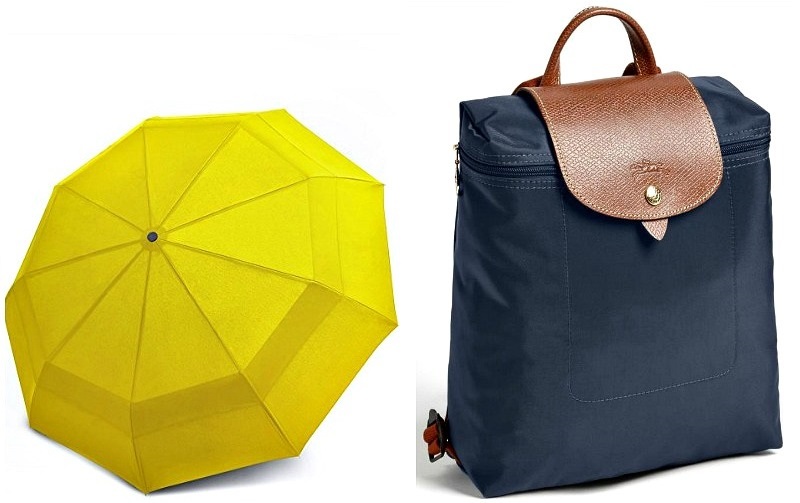 You can also bring an umbrella for the occasions when you’ll spend more time in the rain. If you aren’t expecting much rain, but want to be prepared, a cheap, packable poncho that you can throw into your bag is an option as well. It’s an often-forgotten must to add to your list for rainy day outfits. 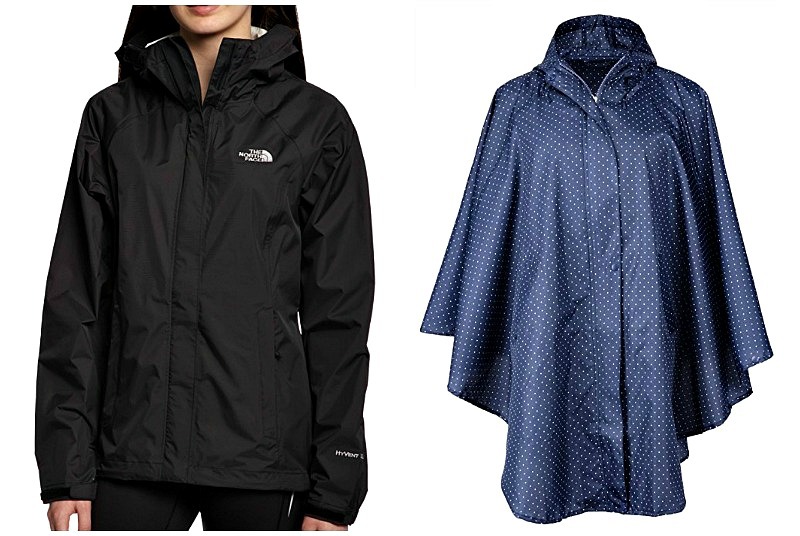 Read this post for stylish travel raincoats for women! When deciding what to wear on a rainy day, leggings, or dresses worn over tights are always a good option. 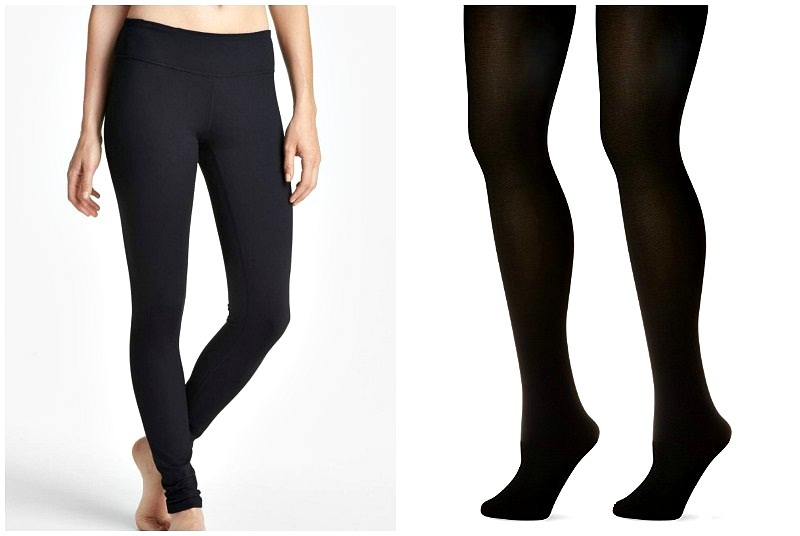 Leggings, and especially tights, dry quickly because they tend to have porous material. Specifically nylon stockings, as nylon is a recommended material by outdoor companies since it dries quick, is lightweight and breathable. Make sure to avoid cotton leggings or trousers and stick to synthetic fabrics. Jeans aren’t the best option for rain either; their thick fabric holds moisture against your skin and takes longer to dry. 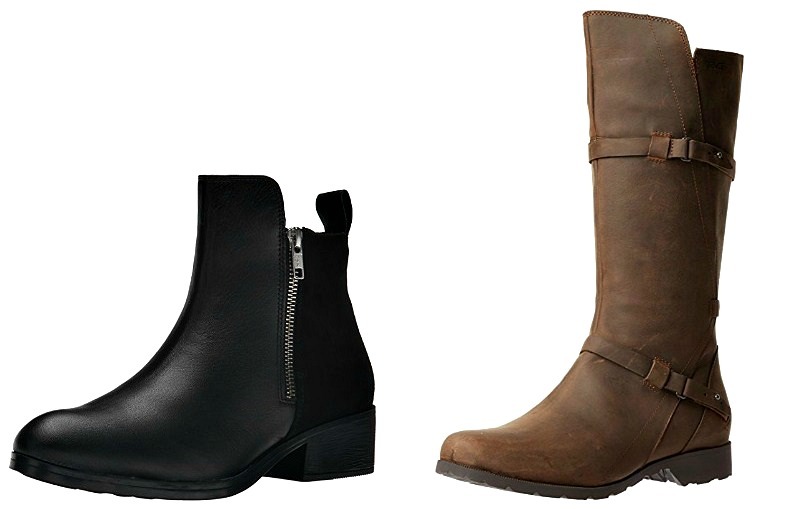 For an outfit that will take you from rain to ritzy, wear leather boots that are waterproof and style-forward. Pair with black tights and a dress that can work for both day and night. 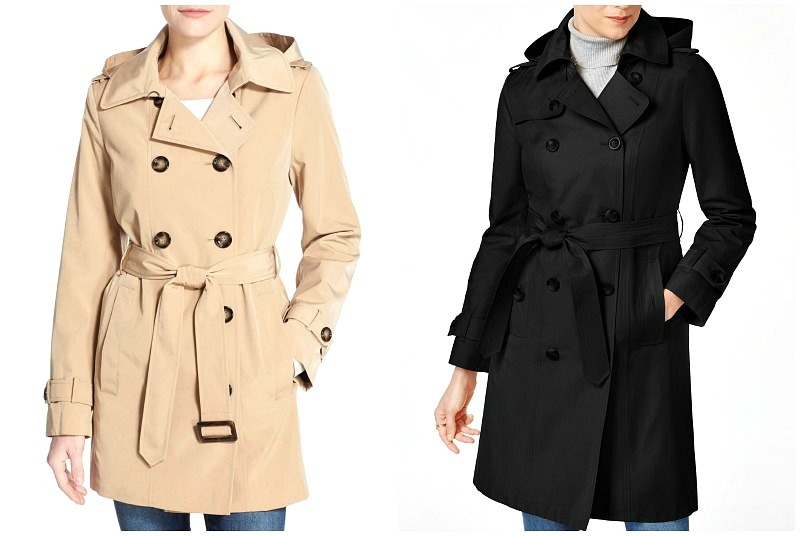 Finish it off with a waterproof trench coat and a compact umbrella that can easily fit in your purse. 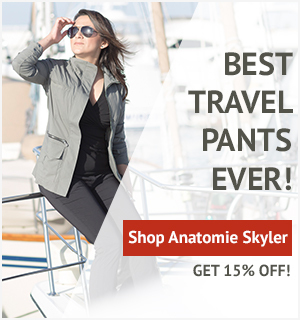 Take a look at the top leggings for travel! What make-up should I wear? Even with an umbrella and the right jacket, you can’t avoid the wind blowing some water into your face. So, deciding what to wear on a rainy day also includes makeup! Obviously, waterproof mascara is a given if you do plan to wear makeup. Tinted moisturizer is also great option because it tends to soak into your skin more than foundation which rests on the surface. This will also help avoid brown streaks dripping your face. 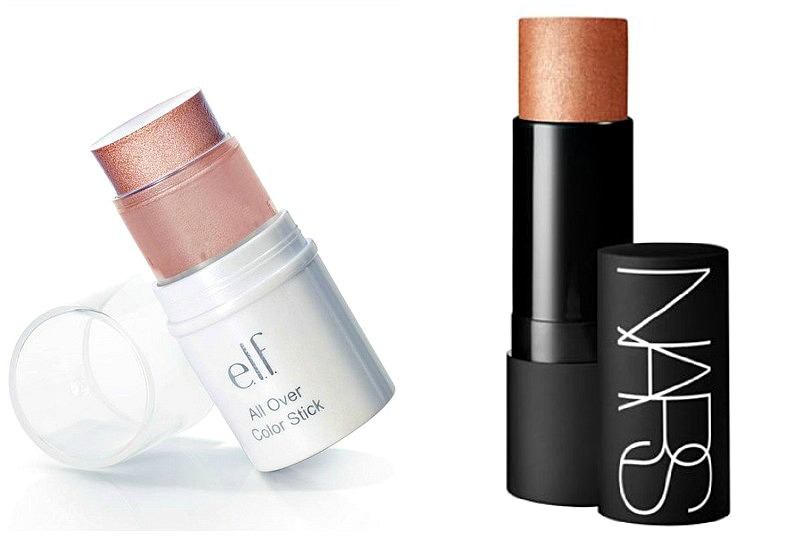 Additionally, an all-over color stick will work better than just powdered blushes or eyeshadows. Color sticks make great travel products in general! Along with working well in the rain, they are multi-functional and pass through security easily. Make sure to bring them along with you on your next adventure, rain or shine. 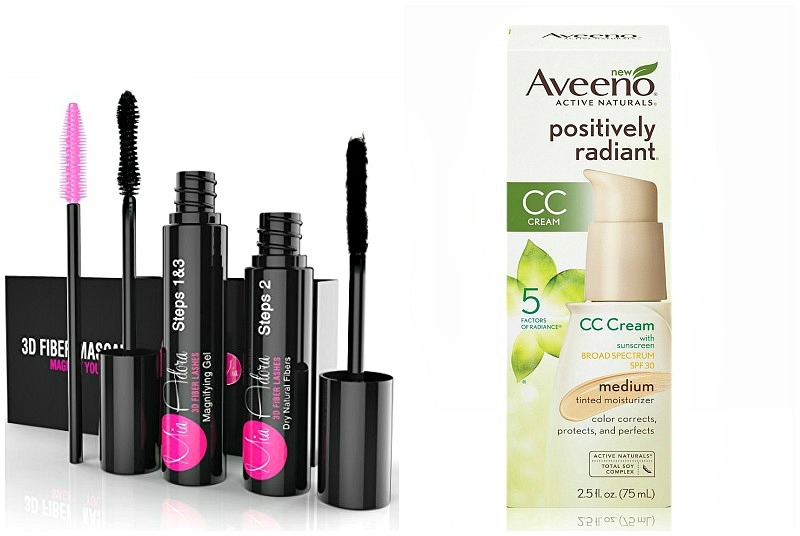 Read this post for more tips on travel beauty products for any season! Will the rain ruin my trip? Of course not! Getting caught in the rain doesn’t have to put a damper on your trip. In fact, make the most of it. Purchase a brightly-colored umbrella that will stand out even in the drabbest weather. Some of those moments have been my most treasured travel photographs. Enjoy a hot bath at night, if the rain made you chilly. Experiencing a traditional rainstorm in places such as England is all part of the cultural experience. Just make sure you carefully plan what to wear on a rainy day and bring the right gear. Tip: Try to plan your itinerary according to the rain. For example, save museum visits and other indoor activities for rainy days and make the most of the sunshine when you can. What are your travel tips for what to wear on a rainy day? Comment below! 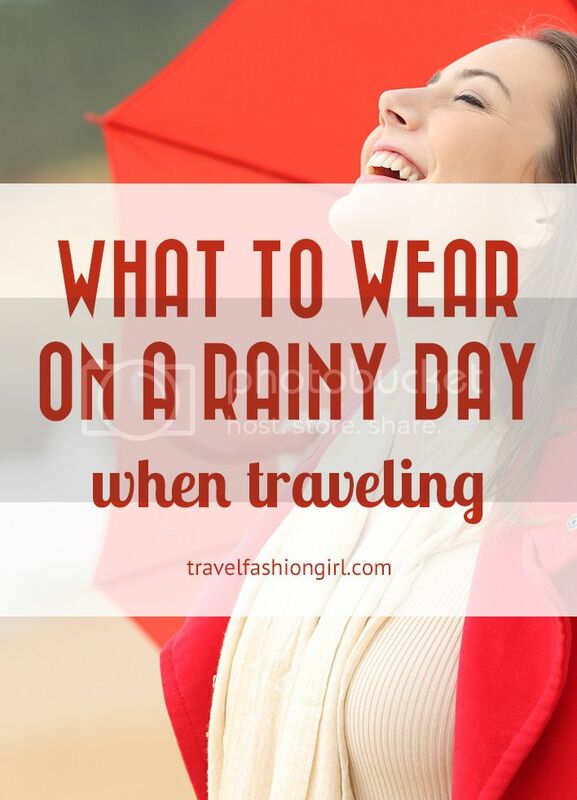 Hope you liked this post on what to wear on a rainy day when traveling. Please share with your friends on Facebook, Twitter, and Pinterest. Thanks for reading! Rain can only spoil your trip if you let it. Prepare before you leave home and then enjoy each day, remember you are on vacation so have fun! I’ve had plenty of rainy vacations, and we’ve never let it dampen our trip! All it takes is some prep and these are great tips! I have an Exofficio Rain Logic jacket. The most expensive jacket that I own…but WELL WORTH IT! It’s very waterproof, long (to keep your thighs from getting soaked while walking), has a hood with a brim, and it has a million pockets! It’s cute too! I wish it had a little stuff sack, but it rolls up and tucks into it’s own hood, so that will have to do! Can you please post a picture and also a link to the Exofficio jacket if possible ? Rain! For my upcoming trip to Italy I’m struggling with whether to bring an umbrella or a coat for the rain. I’m on the lookout for a rain hat too. Thanks for the good tips. Thanks! Have you seen this post: https://travelfashiongirl.com/10-step-packing-guide-italy/ Enjoy! This post helped me a lot. I need some rain gear when I travel but because I live in desert most of the time, I don’t have any and the stores don’t carry much. Sometimes just accepting that you`ll get wet is also an option. When my husband and I spent three days at the Anchor ruins in Cambodia, it was pouring down. Heavy tropical rain all day. We didn`t want to loose the opportunity to explore as much as possible and we didn`t have the opportunity to extend our stay, so we just rode our rented bikes on the muddy roads. We were drenched in rainwater, and eventually mud, but we got to see a lot of the area. And the temperatures were very warm, so being wet didn`t really bother us. Thanks for this! Ever since a rainy trip to Barelona, I struggle with how to be swampy and uncomfortable while not looking completely utilitarian. This is so helpful! Thanks for this summary. We are travelling to the UK and Ireland in May. I have been collecting some rain gear and was not sure which to take. I think I will stick to a Kathmandu wind/rain proof coat as that should be good for both the west coast of Scotland and city stays. I love these travel tips!! 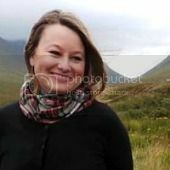 After moving to Europe and getting to travel to so many different places with so many different climates this blog is super helpful!! Really great list! I was recently in Brussels and it rained pretty much the entire time I was there. Rain has this special way of making you feel extra cold–like, to the bone cold–so dressing properly is key. I’ve often found that even though it can be above 10C, if it’s raining gloves can be incredibly helpful. There are also matching hats, rain coats and other accessories. Thanks for the tip Meissoun!